Customers of EDC Wholesale will get the chance to win a store credit of € 2.000 when placing an order in March at the Holland-based company. 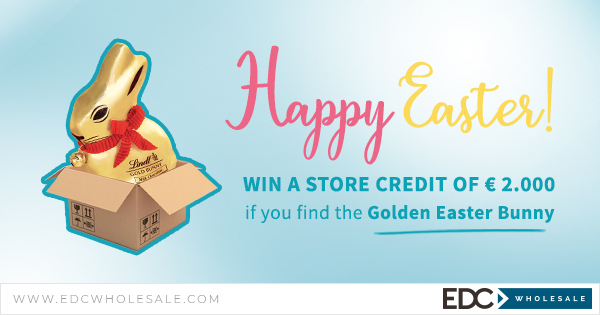 Every year, EDC Wholesale celebrates the Easter season with the Golden Easter Bunny Hunt. Every customer will get the change to win the price, simply by placing an order. Whoever finds the Golden Easter Bunny in its order is the lucky winner of the store credit. EDC Wholesale invites its customers to place an order before the end of the month, while the Easter promo lasts. The company announced that they have many items back in stock. The cute mini vibrators from Lil’Vibe are all available again. The latest addition to the companies assortment is the classy lingerie from LeFrivole, high-end vibrators from NÜ Sensuelle, the Pipedream collections, and the companies house brand Ryder Condoms. All-in-all, EDC Wholesale offers retailers a one-stop-shop collection with a wide selection of adult toys, novelties, and lingerie from more than 120 of the industry’s best manufacturers, which is supplemented with a wide range of house brands, offering a unique selection for a wide audience. For more information please visit www.edcwholesale.com or contact sales@edcwholesale.com.